Cy kick CS has a label that states this great insecticide can be used virtually EVERYWHERE and for almost ANYTHING! A long list of pests including ants, bed bugs, spiders, termites, beetles and much much more is listed! Using a seemingly unending supply of capsules, Cy-Kick CS barriers make it very tough if not impossible for insects to cross the treatment line without exposing themselves to a lethal dose of insecticide and dying. Exposure to the insecticide is energized as the capsules stick to the on the surface where they were applied. Insects will crawl across the capsule barrier, accidentally crushing capsules and causing an immediate exposure to the powerful insecticide. Insects will also unknowingly pick-up capsules that are later ingested during the grooming process or crushed and absorbed into the body. 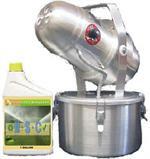 I only takes a short while beofre the readily available microencapsulated insecticide brings death to any insect pests coming into contact with it. Would you like to see the CyKick CS Label? How about the CyKick CS MSDS?